Prince Joachim, the youngest of Queen Margrethe's two sons, met Alexandra Manley in Hong Kong, where she was born and raised. 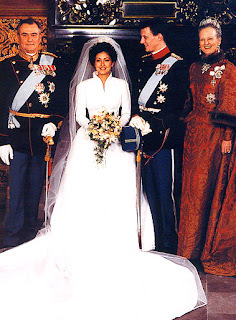 Their engagement in 1995 took many by surprise, but it resulted in a big royal wedding for Denmark - one that would have to tide them over until 2004, when Joachim's older brother would finally marry. For most of her marriage, Alexandra was the de facto crown princess, and she played the part with her style. That style started right away, with her wedding gown. 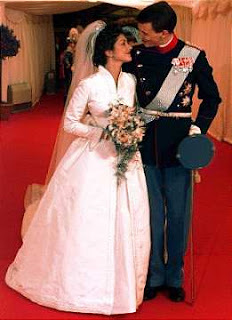 Alexandra’s gown was made by Jørgen Bender, royal couturier extraordinaire (responsible for the wedding gowns of Queen Margrethe, Princess Benedikte, Queen Anne-Marie, and Princess Alexandra of Sayn-Wittgenstein-Berleburg as well as many gala gowns for Queen Ingrid, Queen Margrethe, Queen Silvia, and others). He used whole silk and nearly 9,000 pearls to create the gown. It features a high collar, long sleeves, cummerbund cinched waist, and full skirt with a 4 meter train. The pearl detailing travels around the collar, down the front pleat of the skirt, and around the hem and sleeves. Her voluminous tulle veil and equally voluminous hair were crowned with a diamond tiara given to her by her new in-laws (and which will be tomorrow’s topic, you know how we roll). 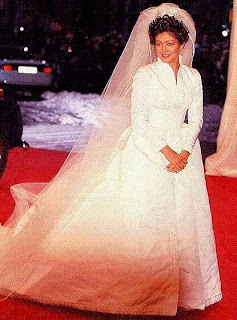 Comparisons to the famous gown of Princess Grace are so common they’re cliché, but I can’t help myself: in my mind this is the gown that most closely resembles Grace’s, right down to the collar and cummerbund and poufed skirt. It’s sort of like a winterized version of the iconic dress from Monaco. 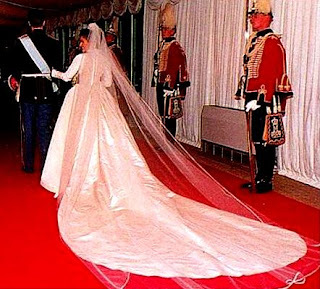 But even with a throwback to another royal, this gown would actually turn out to be a fairly accurate predictor for what was to come in Princess Alexandra’s royal style. Alexandra was game to play the princess role per the storybook ideal: big hair, big gowns and big trains. She wasn’t afraid to be Cinderella every now and then, and I’ve always loved her for that. Of course – and isn’t this always the case? – the real life version wasn’t exactly a fairy tale. 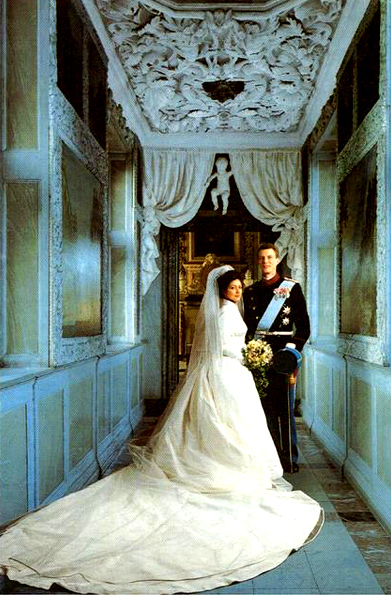 After having two children (Princes Nikolai and Felix) together, Alexandra and Joachim divorced in 2005. Alexandra remarried in 2007 to Martin Jørgensen and is now known as the Countess of Frederiksborg. 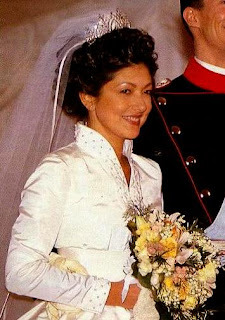 Joachim later married Marie Cavallier. What do you think: too poufy, or just right?